The University of Louisville baseball tradition started in 1909. Coach John Ray led a team of 17 players to a 10-4-1 record. Only 15 games were played, including a tie. Those numbers are rarely seen in collegiate baseball today. To put it in perspective, the 2013 Cardinals baseball team played 65 games — 50 more than their predecessors. In fact, it’s not really possible to call that first baseball team the Cardinals. The much-beloved mascot was not chosen to represent the university until 1913, when a competition was held among the students to choose one. In 1913 the Cardinals did not have a baseball team, due to lack of funding and mismanagement. There are gaps in team history from 1913 to 1919, again in 1923 due to lack of players, and finally between 1943 and 1944 while a majority of eligible men were off at World War II. From that point forward, baseball at U of L was continuous. That first team did not belong to anything as organized and respected as a collegiate conference. It wasn’t until 1924 that they entered the Missouri Valley Conference, and until that time the Cardinals enjoyed several games a season with local high school varsity teams. Travel was expensive. Very little time and resources were allotted to this new sport. Several times that first season, U of L played local high school team Louisville High School… and the older students were not always a shoo-in to win. 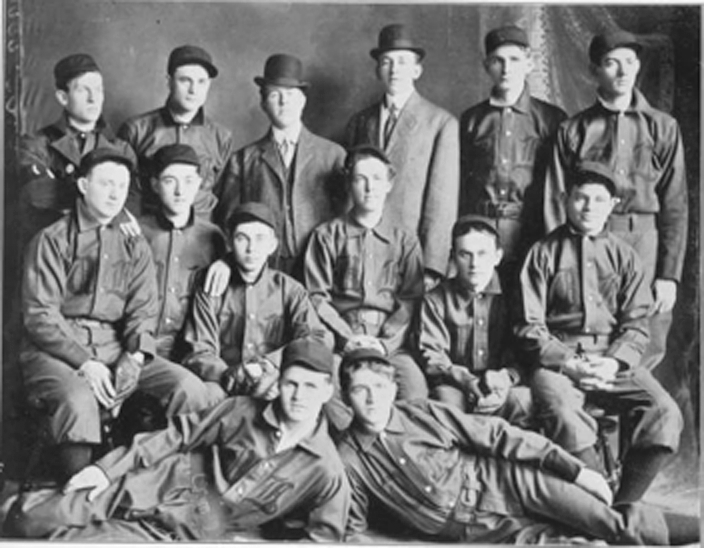 Seventeen men headed this first baseball team. There were the infielders: Byron Blair, J.E. Jenkins, Thomas Walker, James A. Rutledge, and Frank Murray. The outfielders: R.B. Johnson, Corbett Bader, W.H. Nash, H.E. Eggers, and A.L. Bass. The catchers G.D. Griggs and S.C. Arnold, and the pitchers Emmet O’Neal, W.H. Bruce, Clyde Garr, R.W. Carruth, and N.D. Carter. Infielder Thomas Walker captained the bunch, being hand-selected by John Ray as “a man who knows the game.” Though the minor league professional records of the time are virtually non-existent, the only member of the team to play professionally may have been infielder Frank Murray, who seems to have played for the Cedar Rapids Rabbits for a short period of time. Outfielder A.L. Bass went on to become head coach of the team from 1911 to 1912. These men lie in the archives of U of L sports history nearly forgotten. However, the yearbook at the time foresees them as the opposite. “The varsity baseball team of 1909 will go down in history of athletics at Louisville as the greatest team that ever wore U of L colors,” the 1910 yearbook boasts. “It will always be remembered as admirably captained, well-managed, playing a clean, scientific game from the first to the last.” Though the team had a winning record, they wanted to be most remembered for their clean game and good sportsmanship.